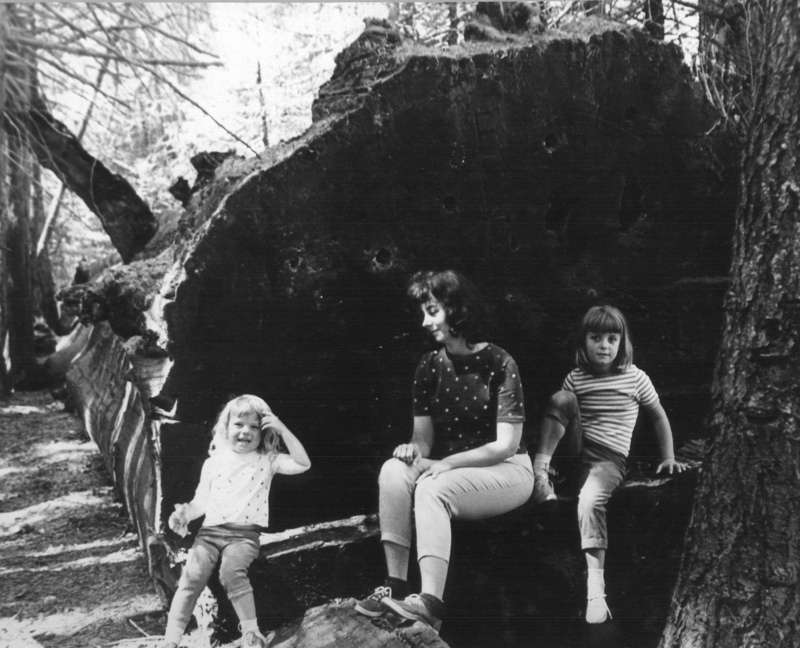 I discovered Nelder Grove in 1969. John Muir discovered it in 1875, and John Nelder discovered it a bit before Muir. It’s safe to say that the Indians of the Sierra saw it hundreds of years before any of the rest of us. Muir was hiking in the Sierra Nevada a bit south of what is now Yosemite National Park and a few miles east of the future California Highway 41, seeking redwood trees. He spotted the grove from nearby Fresno Dome, and when he hiked to the trees, he found Nelder, a retired miner, living in a rough cabin. 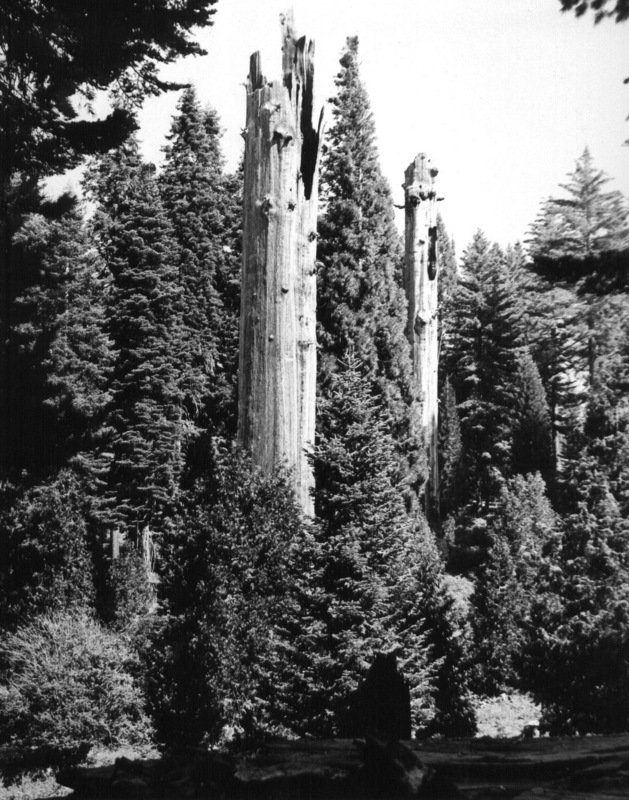 The grove was first called Fresno Grove, but the name was later changed to honor the old pioneer. 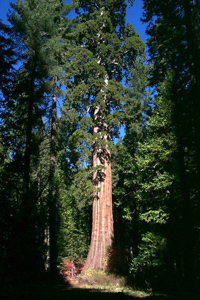 Nelder is one of eight relatively small giant sequoia groves north of the Kings River (there are dozens of groves, some with hundreds of trees, south of the Kings). 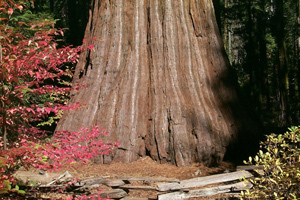 The best known is the Mariposa Grove in Yosemite National Park. Nelder, located about five miles south as the hawk flies, is probably the least known. 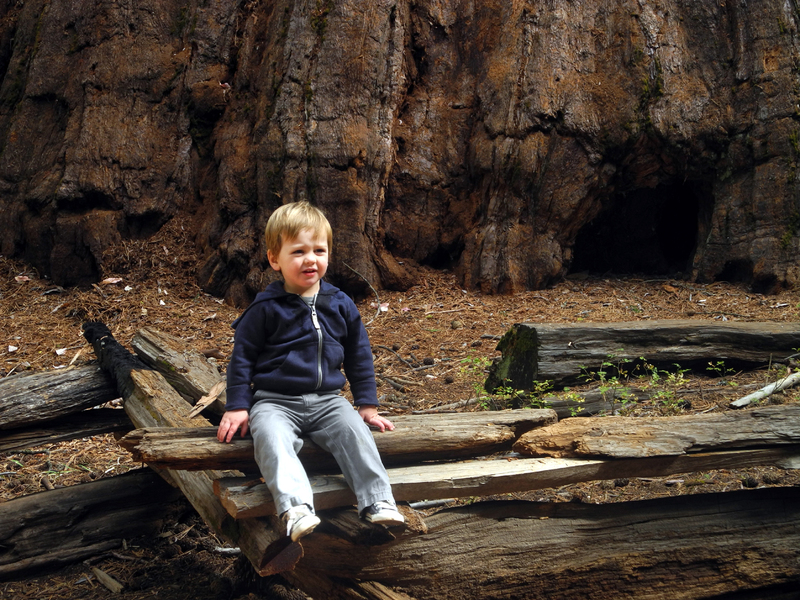 Nelder Campground is located about 10 miles off Highway 41, and the last few miles is a rough dirt forest road. The first thought that strikes the visitor arriving at Nelder Campground is "they cut down the trees!" 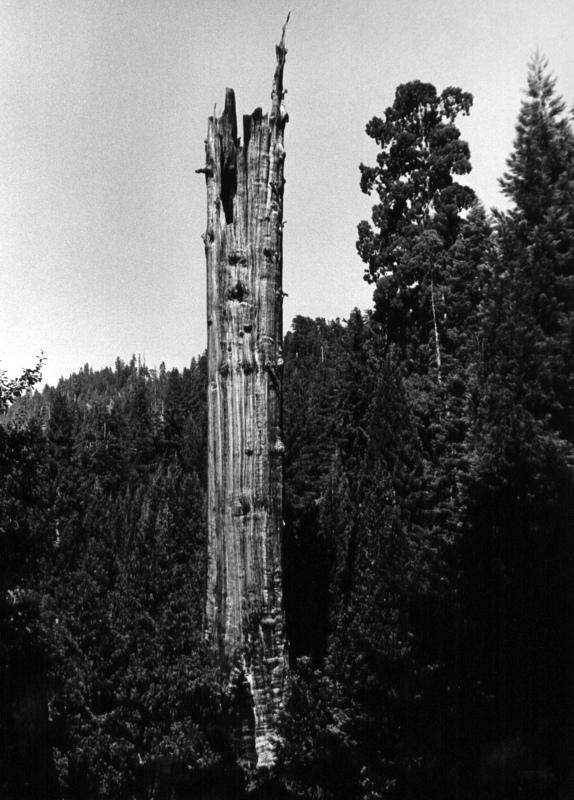 And indeed, dozens of the huge trees were cut between 1888 and 1892, by the Madera Flume and Trading Company, which operated three mills in the area. Cutting one of these forest giants was a week’s work. Because of the brittleness of the wood, it was necessary first to build a bed of branches to soften the fall. 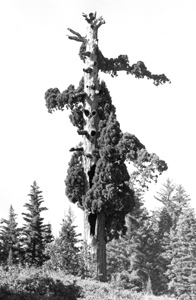 Then, standing on springboards notched into the thick bark 15 to 30 feet above the ground, the logger would chop out the undercut and cut through a thousand years' growth with saws 25 feet or more in length. 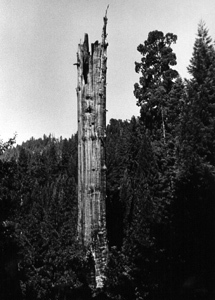 Once the tree was down, it was stripped of its bark, and logs of workable size were bucked out. 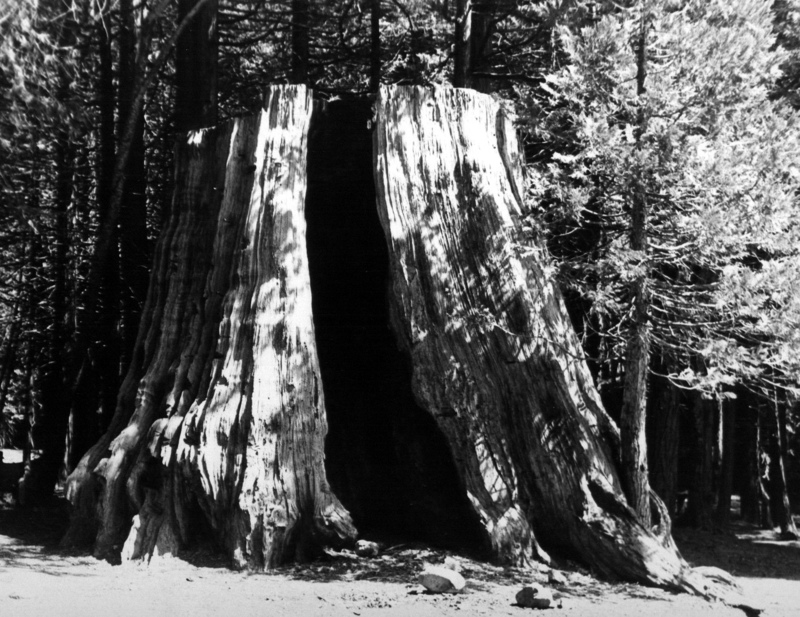 Much of the wood above the first hundred feet or so was left on the ground, where it can still be found, as solid as the day it fell. 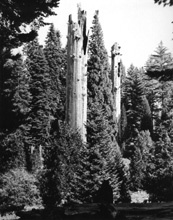 The Madera Flume & Trading Company fell on hard times, and was taken over by the Madera Sugar Pine Company., which became the most successful and longest lived logging operation in the southern Sierra. Although this outfit lived up to its name and cut mostly sugar pine, it did produce a small amount of redwood lumber from some of the logs left on the ground by its predecessor. 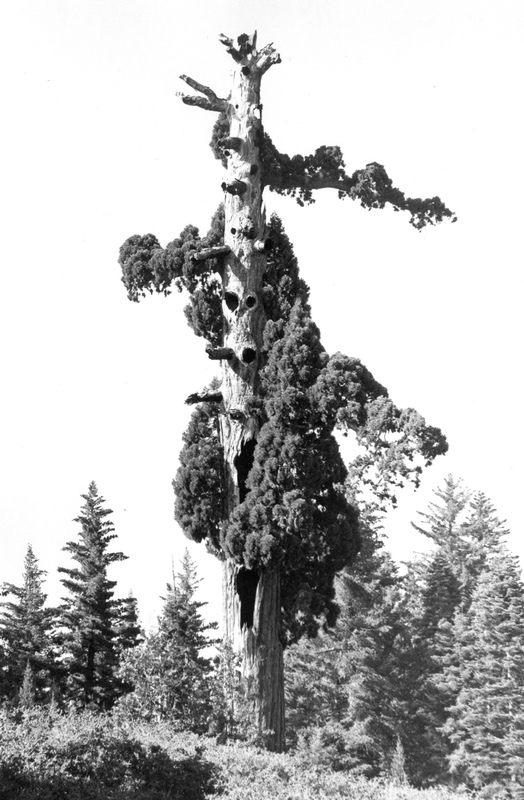 Despite the logging operations, which were unfortunately careless and wasteful, many giant trees, too large to cut and work with, still stand; and Nelder Grove is also notable for the many young Sequoias which flourish in the area. 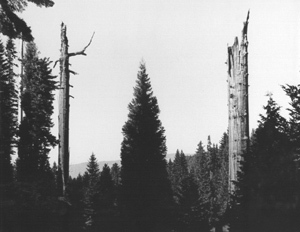 Today most of the signs of this pre-conservation era logging have been erased by nature and the careful management of the United States Forest Service. 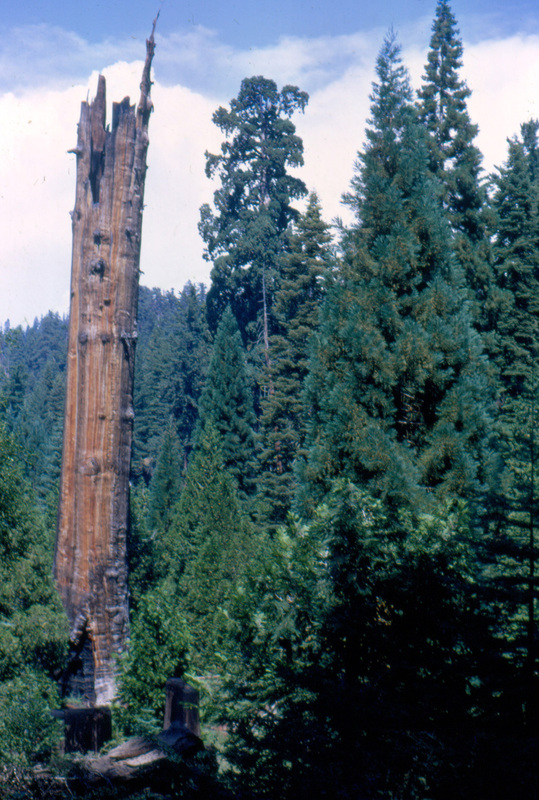 But the huge stumps still stand as a monument to the determination and ingenuity of man, and as a reminder that nature’s resources are not given to us in endless supply. Since I wrote the above for a book I made of my Nelder Grove photos, the trees and stumps have remained pretty much unchanged. But there have been many changes in the grove and in my life. My age has doubled, to 60. The little girls I photographed next to the trees are grown up and have husbands and one has two sons. I have grandsons, college age and elementary school age (the older one has been to Nelder many times; the younger made his first trip in 2001). When we first started going to Nelder Grove, three roads led in and out; now it is on a dead-end spur off a rough forest road. The other two roads are closed and are being reclaimed by the forest. Outside the campground, the countryside was nearly impassible due to the dense growth of young trees and fallen wood. It was nearly impossible to see the big stumps and trees that are nearby. In the 1970’s a project was begun to clear out a lot of smaller trees (mostly cedar, fir, and pine), restoring the forest to a more open, natural condition that permits walking and seeing. On my first visit to the Bull Buck I had to stand within 20 feet of the tree and tilt my head way back to see the top; now you can stand far enough away to get the entire tree in the viewfinder of your camera. Trails have been built from the campground through the woods, although one is officially closed. The grove also boasts a 10 foot square relief map of the area and a display of 19th century logging practices. The area continues to hold its fascination for me, and I hope you will enjoy this attempt to convey some of its wonder. The last update was written in 2001. Now in 2009 another update is due. In October, 2008, I decided I wanted to make at least one more trip to the Old Granddad Tree, located in the upper part of the grove, accessible now only by foot on the old, abandoned dirt road that I first drove on at the time of the logging truck incident. It had probably been 20 or 30 years since I was last there, but I was not prepared for the changes that had taken place all over the area. Joined by my daughter Jennifer and her husband Rod, we parked near the campground and started up the old road. After a fairly steep climb, the road levels off, but until we reached that spot I did not realize we had gone that far, because several landmark trees along the way were hidden by new forest growth. I am talking about giant redwoods, that were clearly visible from the road during my early years going to Nelder, that are now almost impossible to spot. 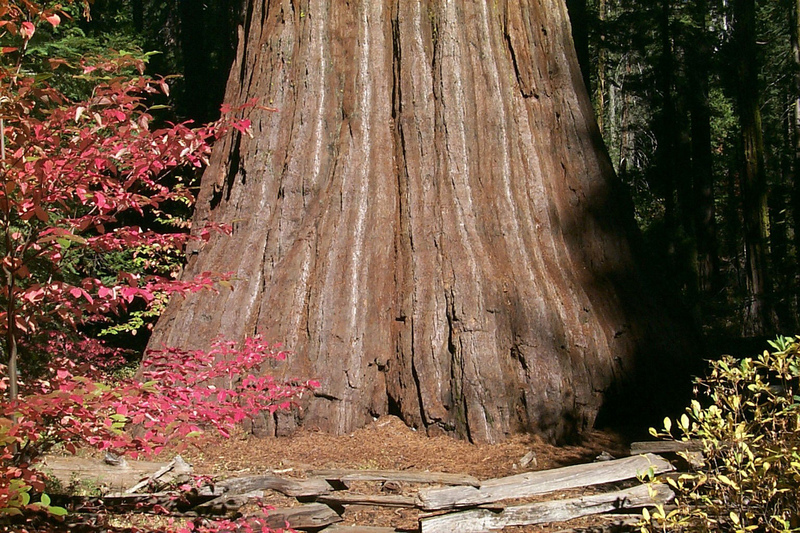 You have to know where to look, then you can see glimpses of the big red trunk or the top through the trees that have grown up. It was even worse at the Old Granddad Tree area. 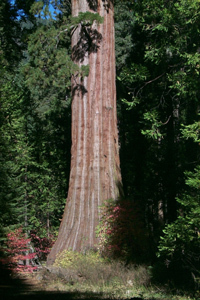 When I first drove into that area I came around a bend and saw a small basin below the road with six or eight big stumps, a huge dead redwood snag (100 feet tall or so), and another equally large snag above the road on the opposite side. Arriving there this time, I did not recognize anything, until we came to the upper snag, after we had already passed by the other landmarks. Again I was finally able to pick out the stumps, the lower snag, and another large snag through the trees. 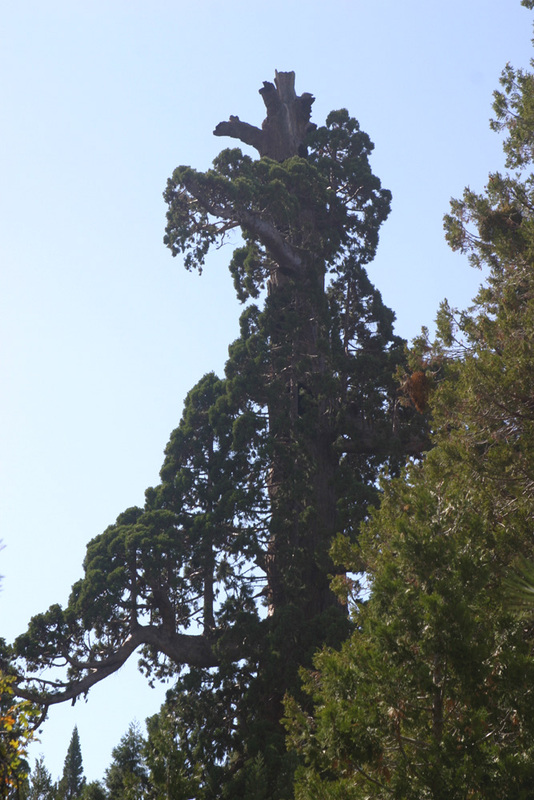 There was a sign pointing up a new narrow trail to the Old Granddad, but I walked right past the giant tree at first. Jennifer and Rod were ahead of me and had seen a broken sign that some other hikers mentioned to them, that read “and.” Looking at it, I realized it was all that was left of the sign that had been there nearly 40 years earlier, that used to read “Old Granddad and the Grandkids.” Well, the kids are all grown up, and you can only get a look at the top of the Old Granddad, and not that good a look. It was very disappointing to me, but a good lesson in how the forest recovers from fire, cutting and other events. The stump basin had been burned over a number of years before I first saw it, and was full of small trees and brush, so it’s not surprising that it is now full of trees that are 30 feet tall, and obscure the view. This is still a fascinating area, but I am glad that I took those photos of the way it was when I first saw it nearly 40 years ago. The changes at Nelder Grove have continued, although this section will include some that happened even before my updates of 2000 and 2008. By the mid-90s, there was a campground host on duty at the campground during the peak summer months. The longest serving were John and Marge Hawksworth. He was instrumental in getting much of the trail construction done, as well as the viewing path at the Bull Buck, improved the 3-D topographical map, and in general did much to preserve and protect the area. Meanwhile, trees grow, trees fall, brush accumulates, and changes, both good and bad, are unending. Most years fire crews cut small trees and pile up forest debris for winter burning along the major trails. 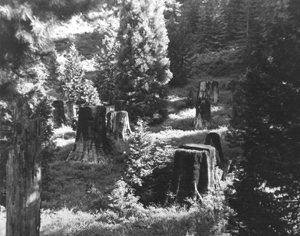 The logging display area is kept in good condition, and despite some re-growth, the area around it is still open enough to offer views of huge stumps and abandoned sequoia logs that were hidden to visitors in the early 1970s. Two trails lead to the Bull Buck, a half mile route through the forest, and the old road, which is a quick quarter mile walk. 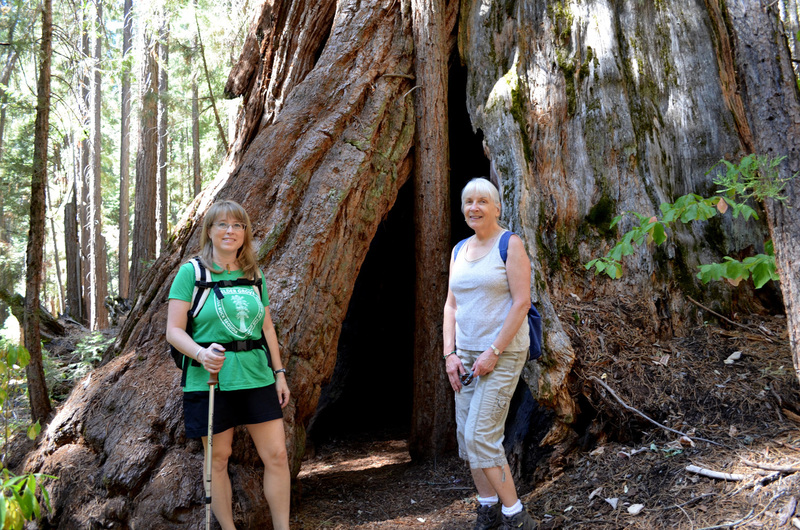 The Chimney Tree Trail, a one-mile loop, starts near the campground and comes out just below the Bull Buck. Along the way are a number of large trees and stumps. A short trail leads from the logging exhibit to the Big Ed, which stands just across California Creek and up the hill from the lower camp area. 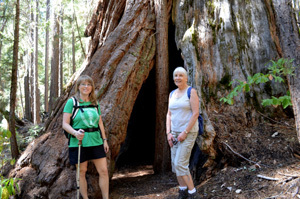 Brenda has created a trail guide and placed signs along these trails. The old road to the upper part of the grove is now the Graveyard of the Giants Trail, and in some places it's hard to realize it was ever drivable. Sadly, one of the nicest spots in the Grove, Nelder Basin, is pretty much impossible to get to. A few hundred yards upstream from where Nelder Creek crosses the Graveyard trail, there is a nice meadow, with a huge sequoia log leaning out over it like an upward slanting diving board. Beyond this the creek runs through a nearly level area with four or five magnificent trees strung along the stream. Back in the day we were able to drive into this spot. I tried to walk in there with my daughter Jennifer a few years ago, and despite considerable effort, we could not even get to the meadow, due to fallen trees and brush. There appears to be little hope that this will be cleared away. Despite all these changes, Nelder Grove remains a very special place, and I will continue to visit there as long as I am able. This is not a report based on my own observations, but rather a summary of things I learned from a talk given by the woman I consider the "guardian of the grove," Brenda Negley. Her grandparents, John and Marge Hawksworth, were campground hosts for 20 years, and Brenda spent her summers there as child and teen. More recently she has been the host herself, and established a non-profit organization to promote and protect the grove. She spoke at the September meeting of The Westerners. 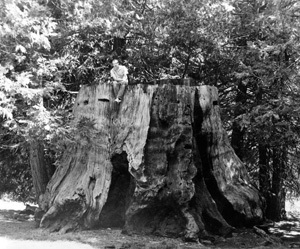 There are 277 mature stumps in the grove, many more than I realized. 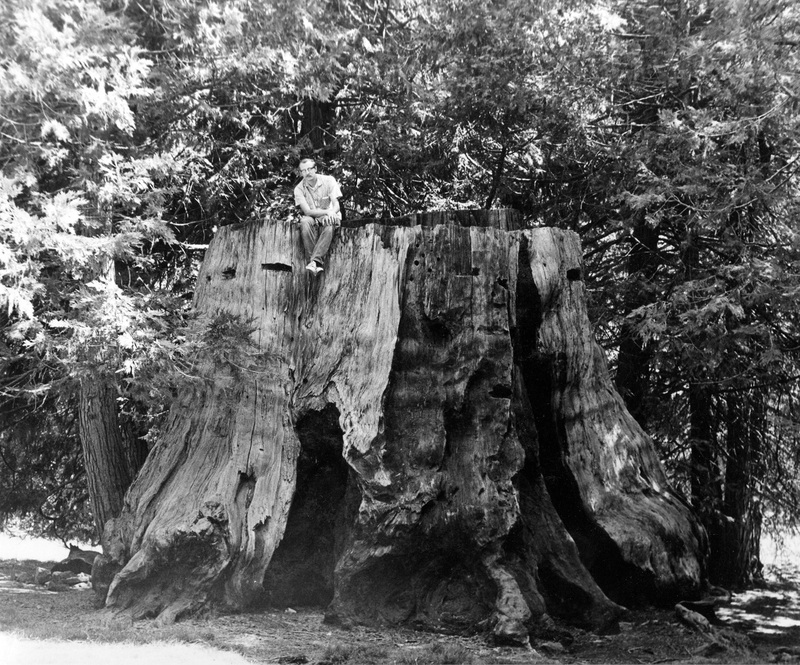 The very first tree taken down was the Forest King, felled not for lumber, but for display. It was felled roots and all by undermining it with water. A slice was taken out and exhibited around the country. 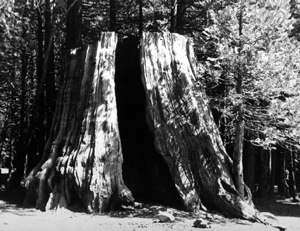 A sort of round cabin created with the bark from this slice was owned for a time by P.T. Barnum. Eventually it ended up on a farm in New York and its ultimate fate is unknown. There are about 102 mature sequoias in the grove, but this number may drop below 100. The Railroad Fire in 2017 burned into part of the grove, causing extensive damage in some areas. 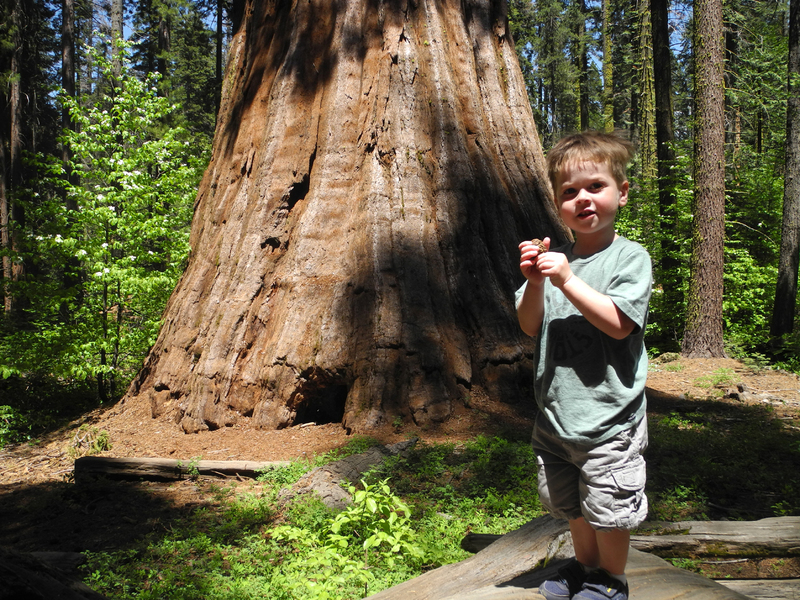 The Shadow of the Giants Trail is closed and many of the trees there are badly burned. Some have no green foliage and may not recover. Even more dismaying on a personal level is the fate of the Old Granddad. The huge horizontal limb near the top is gone and the top of the tree is badly damaged. The Bull Buck Tree, the Chimney Tree Trail, and the area around the campground escaped the fire. John Nelder's cabin was located in Nelder Basin, just upstream along Nelder Creek from the Graveyard of the Giants Trail, which was a drivable road during my first visits to the area. The Railroad Fire burned into this area but apparently the damage is minimal.